and get the accurate fare upfront. Sometimes, just one stop isn’t enough. From today, you’ll be able to add an additional stop to your booking. It’s more convenient than ever to quickly pick up a friend along the way to your destination, or to drop off your loved ones before heading home. Drivers will be notified of both stops when they receive your booking, so sit back, relax, and enjoy the ride. Note: The extra stop has to be added before the booking is made. Stops cannot be added, removed or changed once a driver is allocated. 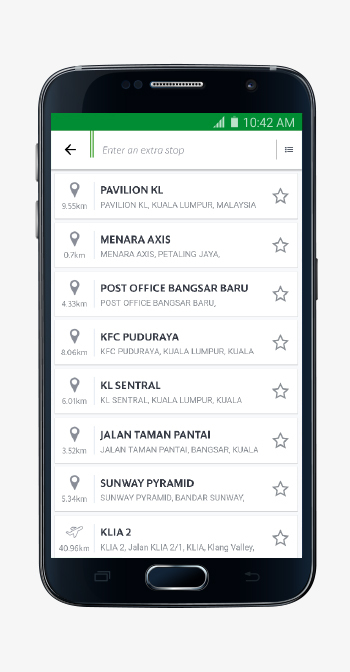 After entering your Pick-up and Drop-off points, tap “+” to add an extra stop. Select the location of the extra stop. Tap the “swap” icon to switch the order of your stops; fares may change. 1) A surcharge of RM 15 will apply for bookings to and from KLIA / KLIA2 and Sepang. 2) The fixed fare of RM 65 to and from KLIA / KLIA2 does not apply. 3) A surcharge of RM50 will apply for bookings to and from Genting. For which services can I book a ride with an extra stop? You can book rides with an extra stop for GrabCar only. How many extra stops can I add to my booking? You can only add one additional stop to your GrabCar booking, and you will be shown the upfront fare. The upfront fare includes the cost of the extra stop and is based on the total distance travelled. Can promo codes / discounts be applied to rides with extra stops? Yes, any existing promo codes and discounts may be applied. Will the fare remain the same if I switch the order of the stops? As the upfront fare is determined by the total distance travelled, the fare will increase or decrease accordingly when the order of the stops is switched. How long can the driver wait at the extra stop? Your driver will only wait up to a maximum of 3 minutes at your pick up point. If you require waiting time at the first stop, please book two separate rides. Can I ask the driver to travel to the second stop and then to the first stop? No. The fare is pre-determined at the point of booking based on the original order of the stops. I need an extra stop but forgot to include it into my GrabCar booking. Can I request for the driver to make an additional stop?